This airticle is aboot Greenwich in Ingland. 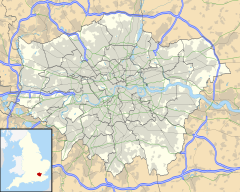 For ither uisses, see Greenwich (disambiguation). Greenwich (UK i/[unsupported input]ɡrɪnɪdʒ/ US /ɡrɛnɪtʃ/ or /ɡrɛnɪdʒ/ is a destrict o sooth-east Lunnon, Ingland, locatit in the Royal Borough of Greenwich an situatit 5.5 miles (8.9 km) east sooth-east o Charing Cross. Greenwich is notable for its maritime history an for givin its name tae the Greenwich Meridian (0° langitude) an Greenwich Mean Time. The toun became the steid o a ryal palace, the Palace of Placentia frae the 15t century, an wis the birthplace o mony in the Hoose o Tudor, includin Henry VIII an Elizabeth I. The palace fell intae disrepair durin the Inglis Ceevil War an wis rebuilt as the Royal Naval Hospital for Sailors bi Sir Christopher Wren an his assistant Nicholas Hawksmoor. These biggins became the Royal Naval College in 1873, an they remained an establishment for militar education till 1998 when they passed intae the haunds o the Greenwich Foundation. The historic rooms athin these biggins remain open tae the public; ither biggins are uised bi University of Greenwich an Trinity Laban Conservatoire of Music and Dance. The toun became a popular resort in the 17t century an mony grand hooses wur built thare, such as Vanbrugh Castle (1717) established on Maze Hill, next tae the pairk. Frae the Georgian period estates o hooses wur constructit abuin the toun centre. The maritime connections o Greenwich wur celebratit in the 20t century, wi the steidin o the Cutty Sark an Gipsy Moth IV next tae the river front, an the National Maritime Museum in the umwhile biggins o the Royal Hospital School in 1934. Greenwich formit pairt o Kent till 1889 when the County of London wis creatit. ↑ Wells, John C. (2000). Longman Pronunciation Dictionary (2nd ed.). Harlow: Pearson Education Limited. ISBN 0-582-36467-1. ↑ Jones, Daniel (1997). English Pronouncing Dictionary (15th ed.). Cambridge: Cambridge University Press. ISBN 0-521-45903-6. ↑ Collins English Dictionary (3rd updated ed.). HarperCollins. 1994. ISBN 0-00-470678-1. ↑ "Greenwich Mean Time". American Heritage Dictionary of the English Language. Houghton Mifflin. 2001. Retrieved July 6, 2011. Wikimedia Commons haes media relatit tae Greenwich. This page wis last eeditit on 19 Juin 2017, at 23:26.